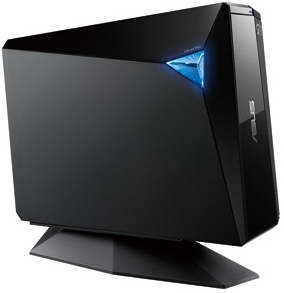 ASUS offers the most complete Blu-ray selection with the fastest performance and award-winning design, including external and internal writers, combos and players with 3D support. The company has just launched the new BW-12D1S-U, the world’s fastest external 3D Blu-ray writer. It enables an easy transition from DVD, the fastest and most reliable Blu-ray burning performance, and a unique artistic approach to optical media. With burning speeds up to 12X via USB 3.0, Optical Tuning Strategy (OTS) technology for the best writing quality available and high definition 3D playback, the BW-12D1S-U further highlights the attention ASUS pays to design, arriving in a form inspired by diamond shapes. It also includes a unique blue power indicator for an artistic touch, and features a matching stand that allows for practical two-way horizontal and vertical placement to help users save space with increased versatility. ASUS Blu-ray devices now support 3D playback across the range, offering 2D to 3D conversion and full 1080p HD with no quality compromise. In order to afford an easier and faster transition from DVD to Blu-ray for consumers, ASUS has implemented powerful upscaling of non-HD DVD content to HD standards. By doing so, ASUS effectively protects the investment by consumers in large DVD libraries over the last decade and longer. Audio performance for all Blu-ray content supports both Dolby® EX and 5.1-channel DTS-HD, offering high definition sound as part of modern home entertainment setups. Sound decoding ensures no degradation of original audio sources occurs, so users are guaranteed faithful reproduction and crisp sound in every application. ASUS incorporates the finest components and latest technologies in its optical drives, leading to output well above industry standards. The current Blu-ray writer lineup offers the world’s fastest Blu-ray burning speeds, with devices now performing at up to 12X. Additionally, OTS technology ensures optimized burn strategies for each job. ASUS drives go beyond speed to guarantee fidelity, so burns take less time while always maintaining reliability and complete success rates. ASUS Blu-ray devices take a different approach to component design. Unlike generic optical drives, they bring to the fore exciting presentation. Drawing inspiration from natural and architectural forms, ASUS designers have crafted the most unique Blu-ray drives available for PC while accommodating new technology. ASUS optical drives have won several awards, including International Forum (iF) design awards in both 2010 and 2011 and the Taiwan Excellence Award 2011 for the new BW-12D1S-U.